The thickest traffic at 8;20 a.m. is in downtown Minneapolis. 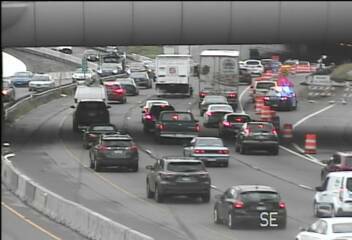 A wreck on eastbound I-94 near 1st Avenue has things jammed up back to the Lowry Hill Tunnel. Westbound slows back near Franklin Avenue due the ongoing road construction. 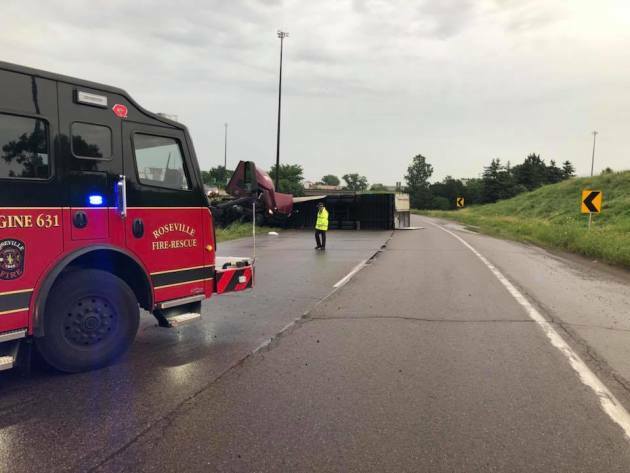 This semi tipped over earlier this morning on northbound I-35W in Roseville. A semitrailer truck crashed on the curve of northbound I-35W just past the split with Hwy. 36 in Roseville just after 6 a.m. Friday. MnDOT said the freeway will remain shut down until noon. The Roseville Fire Department said there were no injuries. Over in Little Canada, one eastbound lane of Interstate 694 at the Interstate 35E interchange is shut down this morning as authorities continue to investigate a fatal crash that occurred early this morning. All eastbound lanes had been closed for about 3 hours, but now traffic is allowed to pass by. Few details are available about the crash, which happened about 2:40 a.m. just before Edgerton Street. In Minneapolis, West River Parkway is closed from 4th Street South to Franklin Avenue due to a mudslide that occurred during Thursday night's storms.